I participated in slam poetry for three years. 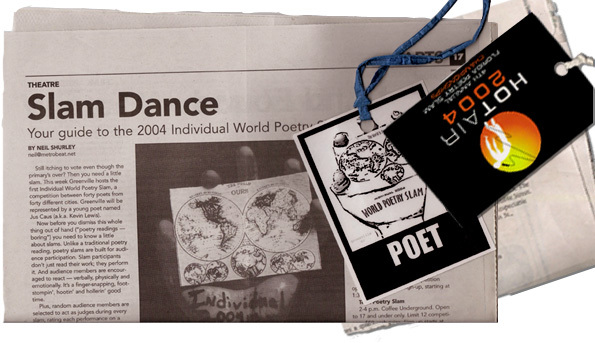 In 2004, I was titled the Orlando Grand Slam Master and was sent to the Individual World Poetry Slam where the top 40 slam poets in the nation compete. The following is the audio for the published piece "Dan Turned 21 and Threw-up on Himself" (lyrics below) (.mp3, 1.8M). This is my application essay for Carnegie Mellon's Entertainment Technology Master's program. When at eight, I built a 3-D model EPCOT out of LEGOs. With discretion and art-repression, I aimed at the engineer profession. But due to the gravity of the field, the mass entertainment had to wait. I'd unmask the fastest way to ride the amusement park ride industry. and to go after an M.E. Master won't help my storytelling much. But a low and behold, I was going to fold, a twofold Masters at Carnegie Mellon. "Barry," I said, "It's seldom a chance to meld up science and arts. (Pardon le French) And not to mention, get l'enfur out of these parts!" Like Bob Hoskins, you can say that I was stuck in animation. Like Bob Villa, I make houses, but they're sets for my claymation. Like Bob Flay, I'm into cooking as I love plate presentation. Like Bob Ross, I have the fro and I find painting brings elation. Like John Wayne, I love to draw, but I'm not that big on guns. Like John Lennon, I'm a writer, but I overuse the pun. Like John Woo, I write some movies, but without a straight Face/On. Like John Connor, I love robots, but not the Terminating one. Now, you can gander my wondrous artwork under wonderbarry.com. First entertainment, then engineering, and then an adhering of the two. For occasions engaging an audience, I think I've had a few. First and foremost, I wrote two books, one of which I have enclosed. It's a novel children's novel like Dahl's and Carroll's I suppose. I also write some poetry, but I hope that's obvious by now. And after competing reading poems, I think my name has got around. And bestowed, I hold "Orlando Grand Slam Master" as my title. I also front-man a band and we are doing well as of yet. You can find more information on that at OffWhiteNoise.net. Where you'll find such things my 1:24 scaled down model of my apartment. I'll highlight in neon yellow and you can note-take in the margins. I am active in both ASME and Pi Tau Sigma, and it's evident. In fact, I'm so active in the latter that I am actually the President. And AutoCAD. I'm glad I'm rapid prototyping this year. That my 4.0 cumulative is how it's been going. These are two ways I found to make mechanical engineering fun. We're engineering a five foot animatronic rat-like monster. As much as I see my pluses, I know no programming at all. Would be my beer, but that's another story and Toy Story too. But seriously, I seriously want to animate in Maya. I know very little Pro E, and even less of Wildfire. And how to apply my technical abilities to entertain an audience. I'd eventually want to build on building amusement motion rides. On CD because the intonation and emphases can't be read. The way I traced a path, it seemed to point me straight at E.T.. I know my style's fuzzy, but the signal's fine don't get up. Let me help out the reception and conclude with a channel set up. And Like Oxygen, I BET that it'll be a GAS, call it ESP'N intuition. But I don't want to stay Home and Garden; rather go "U-pick" Carnegie Mellon. Now I'm hoping for the M.E.T., but getting a museum's not my plan. Out of all the applicants, I want to be an applican.